Sanji's Raid Suit Ability is Stealth. -Robin is searching for Poneglyph in the castle and was found by agents of Oniwaban (a group of government-employed undercover agents). *-*The suit number is 3 and it's called "Stealth Black" an ability that Sanji always wanted. *-*Law knows the Raidsuit since he's from the North Blue. -Page One transforms into Human Beast mode and blows away Sanji, but he suffers no damage due to the Raid Suit. Sanji attacks Page One from above his head who is being off guard thinking he already defeated Sanji. Page One shouts in pain. Scene changes. More detailed spoilers coming soon. -Page One tries to bite Sanji but he dodges him with great speed. After a few moments where we don't see Sanji, he appears with a very powerful kick in the stomach to Page One who falls against some houses. -After the kick Sanji becomes visible, the effect is like Absalom when he used his power. -We see a little flashback of Sanji being a child, reading a book about the Suke Suke devil fruit. Then we see the scene in Thriller Bark in which Sanji is angry with Absalom for having the abilityathat he had always dreamed of. -Page one gets up and changes to his hybrid form. If there were any doubts, it's a man who has "Page1" tattooed on his chest. -Page one launches for Sanji to tear him up but Sanji stops the attack with a kick. However, Page One has more strength and stamps Sanji against houses. -Sanji rises like it's nothing thanks to the Raid Suit. 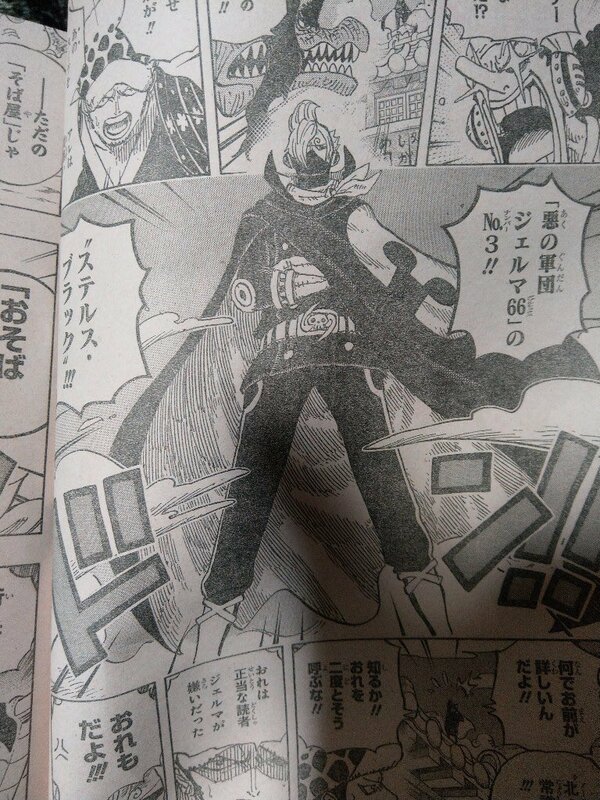 Page one thinks he's already defeated him, but Sanji, who jumped high, throws himself from the sky and hits Page one. 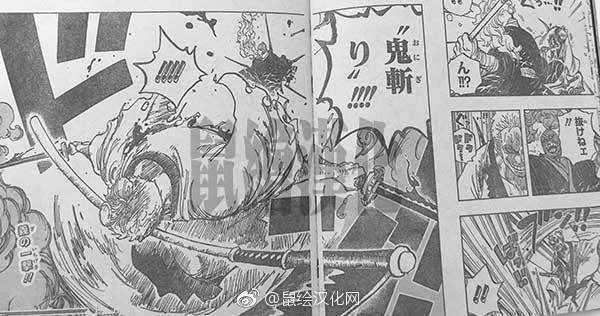 -This blow we don't see because the scene changes to Usopp, Franky and Law escaping the area while Page One cries in pain in the background. -We pass to the Shogun's castle. As the party goes on, Robin goes to a room full of documents and starts reading them. -As she reads the document, she hears a voice behind her. Turning around she sees 10 ninjas around her (the designs are great, typical of Oda). -A door opens and appears the head of this group. He has a very long head (it looks like a "conehead ") and ear lobes like Enel. He wears a kimono, sunglasses and has a very long goatee. - Switches to the beach of Wanokuni, where we have Chopper with Kiku, Tama and Momonosuke. Chopper goes up a few branches of bamboo and sees something giant on the beach. -As the Chopper approaches he discovers that it is Big Mom and remains in shock. The rest discusses the situation but Chopper tries to shut them down so they don't make noise and wake up. -finally Big Mom wakes up but doesn't know who she is, has lost her memory. There's a double page of Orochi's form, 2 heads in the right page and 6 on the left. Only 9 days till the final battle. Spoilers from reddit but I'm not sure about the source so, grain of salt and all. The old man in the mine was beaten by a guard with 6 legs, the old man seem to have swallow something when he panicked, the guard noticed it and Luffy had to come to rescue him with his handcuffs on. The results of this incident are unknown. Edited by Nintendocat, 20 February 2019 - 06:16 PM. 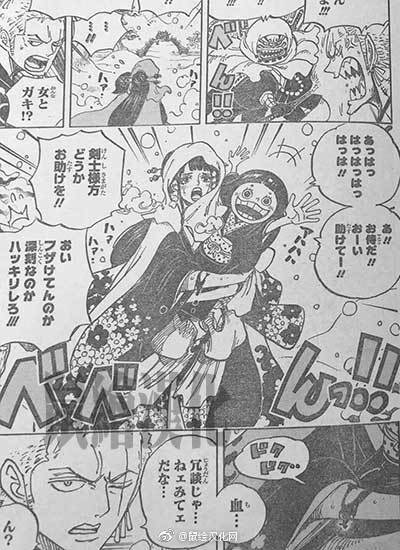 - Perospero has a Vivre Card of Big Mom and it seems that they plan to look for her but I think Smothie gives another idea (I'm not clear about it at all). - Tengu talks to Tama and tells hee to quit (he speaks with a Den Den Mushi mini). 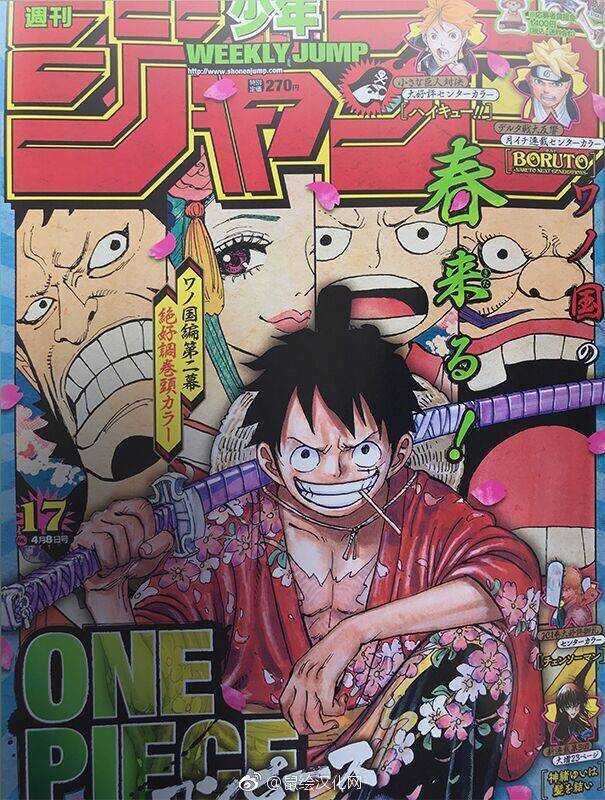 - Big Mom has a typical Japanese hairstyle, similar to Robin or Komurasaki. It is here when we see the map of Wanokuni and they tell us that this group goes to the mines. 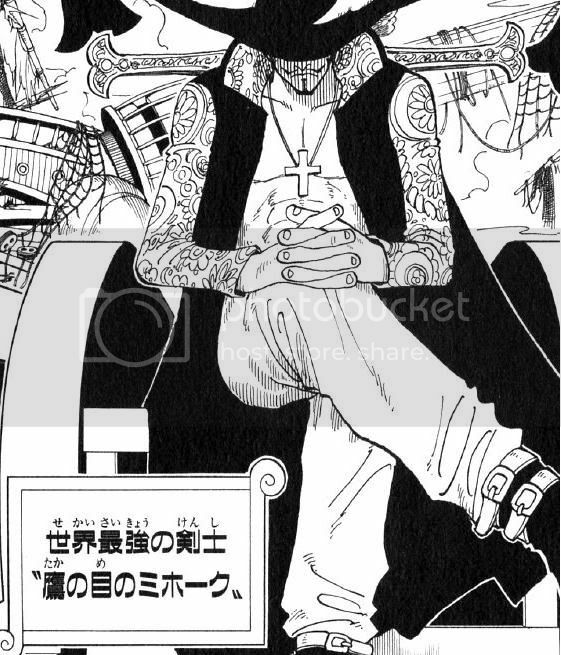 - We also see that Momonosuke talks about Zoro and a very serious image of him appears. -Raizo runs past one of the cell but mysterious prisoner from chap 924 stops him. - Inuarashi talks with Kinemon about tattoos. - In Flower Capital, Kyoshiro talks about tattoos too. - It seems the girl Zoro saved, falls in love with Zoro. - It is confirmed that Zoro have beaten Kamazou. - Last page is about the girl who is named "Hiyori" and she is looking for her brother "Kozuki Momonosuke". Edited by capu, 28 March 2019 - 03:31 AM. Cover Page: Bartolomeo is playing with dolls. The dolls look like straw hat crew, Bartolomeo is waving his fingers like doing magic. - The events go back to Nami and the rest, there is a talk between Yasu and the rest. - Back in prison, Luffy still tries to practice punching without touching the enemy! -Luffy uses the conquerors haki again on the soldiers. - Caribou appears with Raizo in his body. - Kawamatsu is still in the prison and shows his shadow as happened in previous chapters. Obviously Grandpa Hyo is trying to remember the way out of prison. 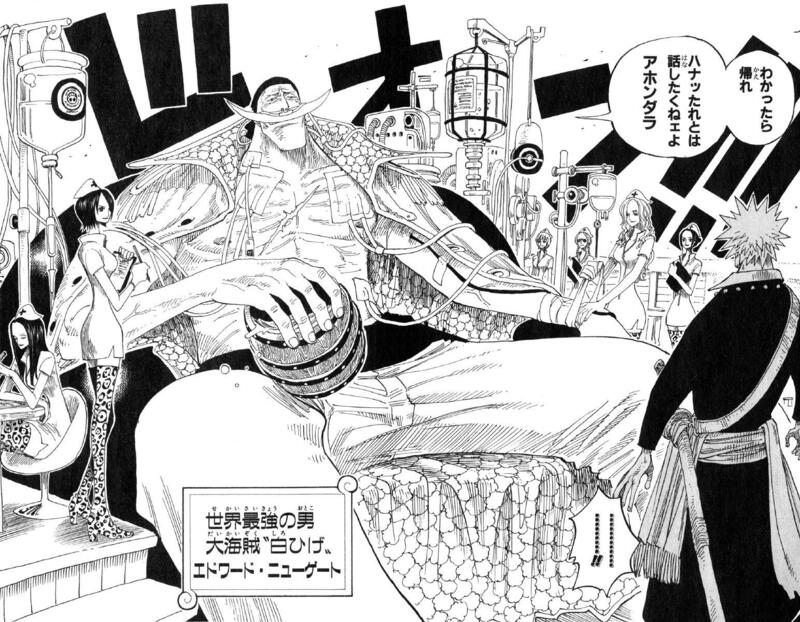 -Last Page: Big Mom appeared with others in front of the Prison. 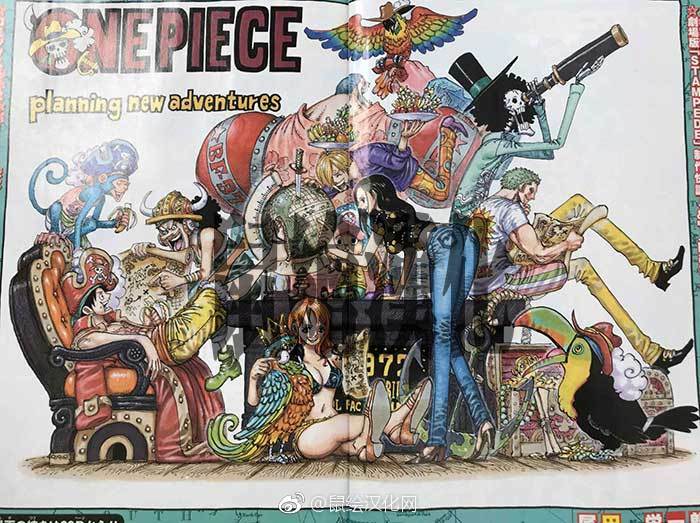 "Chapter 941 will receive a colorful cover for the manga exceeding 450 million copies sold around the world, as well as the cover of WSJ magazine for One Piece.